Science Project Kit 10-pack is a comprehensive test kit for comparing the water quality of up to 10 different water samples. Results on the spot. Perfect for school projects for Middle and High School. WS-425SPT Science Fair Project Kit tests water quality for 8 contaminants: Lead, Bacteria, Pesticides, Nitrates, Nitrites, Chlorine, Hardness and pH. Purity of water has far reaching real life significance. These kits are an ideal platform for science fairs and school projects. They are designed to provide structure and at the same time can highlight student thought and innovation. They are easy enough to be used by elementary school children and scientifically sophisticated enough to be used in experimental investigations by high school students. , and a number of other creative ways to introduce complex chemistry concepts the EASY WAY. You can also add one or a few more tests for contaminants not present in this pack by getting contaminant-specific tests from our list of testing products, some of which you can see below in Related Products box. 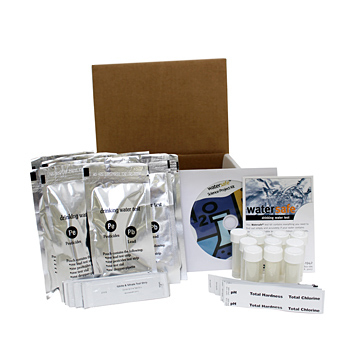 Set of 10 water test kits for 8 different contaminants, total of 8x10 = 80 various tests. This kit is an excellent resource for an earth science fair project, and for middle school or high school chemistry experiments. 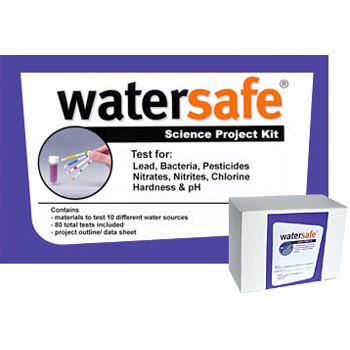 Watch this video to see how easy it is to use WaterSafe Science Fair Water Project Kit to test multiple water sources for school science projects. I highly recommend this science project kit for any student looking for a great science project. My son used this kit for his mid semester science project, and along with his presentation he received high marks from his professor. He even proved that the schools water wasn't as pure as the faculty had hoped. His professor was quite impressed.